After "Hindu Extremism" Jibe, Kamal Haasan Says He Is Not "Anti-Hindu"
On November 2 last year, Kamal Haasan had said he did not believe in what he termed as "Hindu extremism". However, he had not named any particular outfit. Chennai: Actor Kamal Haasan, who is set to launch his political party soon, today said he is not anti-Hindu nor against any other religion or anyone else. "I am not anti-Hindu," he said while adding the fact that he viewed Christianity and Islam in a "similar" manner. On November 2 last year, Mr Haasan had said he did not believe in what he termed as "Hindu extremism". However, he had not named any particular outfit. Stating that his own brother Chandrahaasan and daughter Shruthi Haasan were "devout," he asked how could he be anti-Hindu. 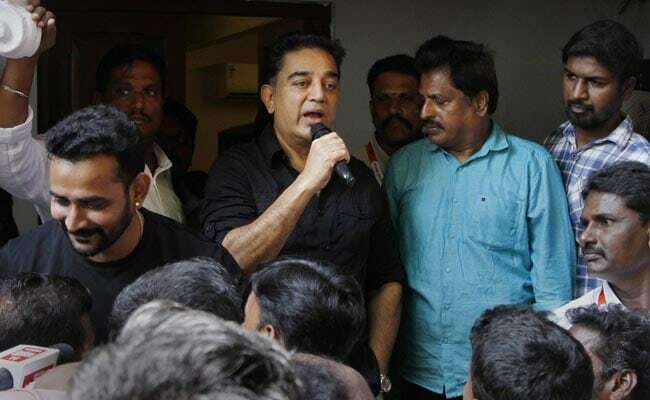 Perceived as a sign of mellowing down ahead of his political plunge on February 21, Mr Haasan asked if he could despise his daughter as she was devout. Mr Haasan said his political meetings scheduled to start from February 21 will be interactive in nature. "I am not against anyone," he said. He was following the same line among his fan club members as well, Mr Haasan said. The actor said he had equal regard for leaders including Mahatma Gandhi, Dr Ambedkar and 'Periyar' E V Ramasamy. On Hindu extremism, Mr Haasan had said "earlier such Hindu right wingers without indulging in violence with those belonging to other religions, made the latter to indulge in violence through their arguments and counter arguments." However, "since this old conspiracy began to fail," the right wingers have also begun to take recourse to violence in case their strategy did not work, Mr Haasan had remarked. "Extremism is in no way a (mark of) success or growth for those who call themselves Hindus," he had said. The remark drew flak from Hindu outfits with BJP calling his remarks "myopic and brazen." A complaint was lodged with police against the actor by Shiv Sena and other right wing outfits for his Hindu extremist remark. On November 7 last year on the occasion of his birthday, the actor had said violence in the name of any religion was not proper. "I don't start with the intention of hurting Hindus. He asserted that he never used the word 'terrorism'.